Turning back the clock! New and Delicious! Hickory and Pineapple! Enjoy our original favorite! We have gone back to basics with our Cook-in' Sauce. No high fructose corn syrup. No preservatives, and now, gluten free! Only 3 grams of sugar. Great on beef, chicken, pork and fish. NO MSG. What could be better than the original? A blend of zesty peppers, a touch of sweetness and just the right amount of spices. We have outdone ourselves with this one! Gluten free with only 6 grams of sugar. NO MSG or HFCS. This BBQ favorite on ribs and chicken, with a sweet 'n smoky taste and a hint of pure pineapple will have you coming back for more. Enjoy on chicken, pork, fish and more. NO MSG. Game Day Food Never Tasted so Good! Try these simple and delicious treats for your game day enjoyment! Crock pot of Flavor: Fill crock pot with individual baby back ribs or chicken wing drumettes. 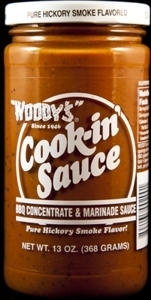 Fill 1/3 with Woody’s® Cook-In Sauce and 1/3 with water. Bring to a bubbling, then let the meat cook for about 3 hours on low. The liquid level will rise to cover your meal. Stir occasionally. Serve at half-time or 7th inning stretch, depending on sport. Variations: Try adding some Worcestershire sauce to the mix. Substitute red wine for some or all of the water. For extra zip, add some “Bold ‘n Spicy” sauce while cooking. Woody’s Burgers **Woody’s® CLASSIC**: To each pound of hamburger, as 1 to 3 tablespoons of Cook-In Sauce, one beaten egg and one chopped onion. Make into patties and cook indoors or outdoors. Woody’s® Dogs: Split dogs lengthwise. Brush cut part of hot dog with Woody’s® and let stand briefly. Grill with the cut side up, then flip and finish with the cut side down. 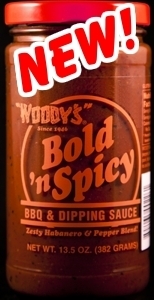 Bold ‘n Asian Dip: 1 part EACH smooth peanut butter, pulp free orange juice and Woody’s® “Bold ‘n Spicy”. Mix well, chill and serve with chips wraps or sandwiches. It’s different! 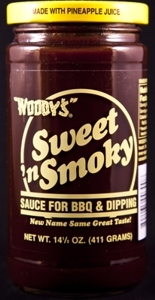 Barbecued (Baked Beans) ** Woody’s® CLASSIC**: To your favorite pork and baked bean recipe, simply add 1 to 2 tablespoons of Cook-In Sauce before heating. Please click here to view our listing of current grocers. If you do not see your local grocery store listed, click here to order from one of our online retailers or click here to contact us and we will send you order information to take with you on your next grocery run! As always, Woody’s® Foods loves to hear from our loyal and dedicated customers. Contact us with all of your Cook-in needs and don’t forget to submit or view your favorite WOODY’S® recipe - click here. Thanks to each and every one of you for your continued support! 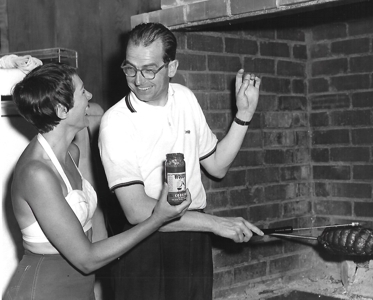 This 1958 photo of Woody with an unknown lady was shot by San Francisco News photographer George Place.